If you've been following us for any extended amount of time you know that we're huge advocates of dry firing your gun. 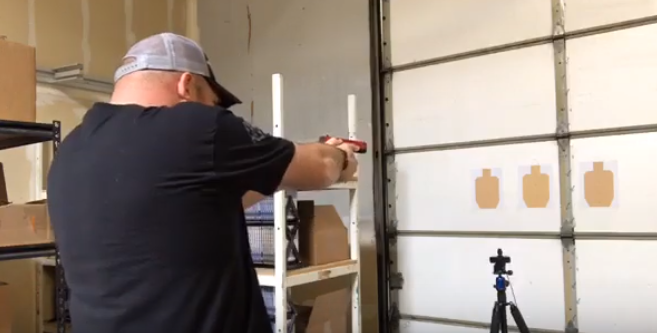 The benefits of dry firing cannot be overstated and it's our belief that anyone serious about self-defense must be doing it at least some of the time in order to effectively increase their skills at the live fire range. You can totally just dry fire in your home using an EMPTY firearm. While this is acceptable and something that will help you, there are some tools out there that will help you tremendously in your quest to increase your shooting mechanics from the comfort of your own home. One of those tools is the subject of Riley's latest SHOP Talk: LASR-X. The LASR-X is great because it gives the user instant feedback on how you're doing, where your shots are landing, and really just helps you improve because you can see what you're doing wrong. One area where the LASR X stands apart from many of the other training software products on the market, is the ability to work multiple different kinds of drills into our training. For example, transitioning from one target to another, and back to the first. The drills you can do with this thing are endless, the Bill Drill, Mozambique, or any of the other drills you've seen or have heard of can all be done with this software. Training in your own home has the added benefit of being able to do what you may not be able to do at the range during live fire. You can practice coming out of the holster, putting “shots” on target, do transitions and other rapid fire type drills. The end result is a more proficient shooter. The deal for this week is 10% off any LASR software using the code: lasrtalk10. That code will only be active for a limited amount of time, usually about one week, so take advantage of it right now. They also mentioned the Ultimate Dryfire Training Course being free for a limited time with the use of this coupon code: ultimatefree. Again, same deal applies with it being a limited time frame kind of deal. Finally, the other training tool mentioned in this video, is the training pistol Riley was using called the SIRT Pistol. There are a few different models to choose from, and is one of the best ways you can train. They're also highly recommended. How do you conduct your dryfire training? You are dryfiring, correct? Let us know in the comments below. Really cant afford a sirt pistol or lasr software, instead I got a laser training cartridge that I use for draw and fire practice or any other imagined scenario I can dream up that could happen out in the world. One good one is to start facing the wall, I raise my hands and strike the wall as if it was a person that is to close then while moving backwards rapidly I uncover and draw and fire at a small target on that wall around 4 inches wide at chest level. I have a number of other drills to. Doug, I also practice draw and trigger press with my bore laser. This offers greater feed back to the accuracy that you are trying to achieve with speed. The only drawback is having to recock the striker every time. I also use my hammer fired pistols which do not need to be recocked every time.